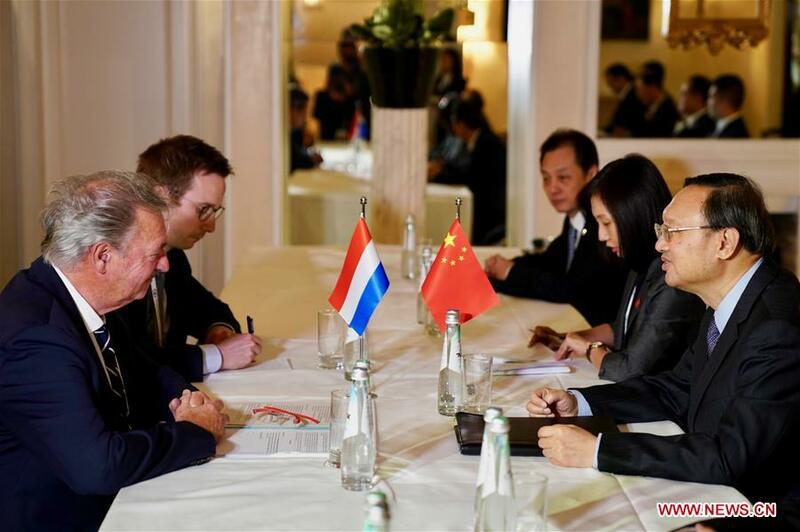 MUNICH, Germany, Feb. 16 (Xinhua) -- China and Luxembourg are willing to deepen practical cooperation and seek common development, senior Chinese and Luxembourg officials said here on Friday. Yang Jiechi, a member of the Political Bureau of the Communist Party of China (CPC) Central Committee and also director of the Office of the Foreign Affairs Commission of the CPC Central Committee, met Luxembourg Minister for Foreign Affairs Jean Asselborn on the sidelines of the 55th Munich Security Conference. Yang said that the China-Luxembourg relations have entered a new stage where bilateral high-level exchanges are close and political mutual trust and economic and trade ties have been continuously enhanced. Both sides should implement the consensuses of the leaders of the two countries, and continuously deepen cooperation in traditional fields such as finance and air cargo, as well as in high-tech fields, so that new highlights in pragmatic cooperation could be created, Yang continued. China highly appreciates Luxembourg's active participation in the China-proposed Belt and Road Initiative (BRI), Yang said, adding that he believes that both sides should hold high the banner of multilateralism and closely communicate and collaborate with each other on international affairs. China firmly supports the European integration process and is willing to enhance economic, trade and investment cooperation with the European Union (EU), as well as to strive to dovetail the BRI with the EU's development strategy, Yang noted. Asselborn said that it is delightful that both sides have maintained close and friendly exchanges. Luxembourg and China have achieved fruitful results in exchanges and cooperation in various fields such as finance, investment and humanities in recent years. Highlighting the importance of communication and coordination with China in multilateral affairs, Asselborn said Luxembourg is willing to deepen pragmatic cooperation in various fields on the basis of mutual respect and mutual trust, and to achieve mutual benefit and win-win results at a higher level.